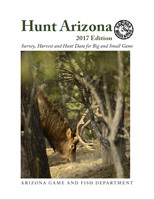 This annual booklet includes season dates, bag limits, hunt types, open areas, rules, regulations, drawing application details, and other requirements for the hunting of most big game, small game, other wildlife in Arizona. Big game species covered in this regulation includes deer (mule deer and white-tailed deer), fall turkey, fall javelina, bighorn sheep, fall bison, fall bear, and mountain lion. Hunt Permit-Tag Application Form – Use this application for permit-tags issued through the lottery / drawing process and leftover permit-tag process. 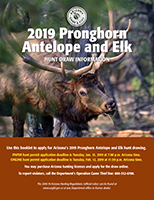 This booklet includes season dates, bag limits, hunt types, open areas, drawing application details, and other information for pronghorn antelope and elk only. The pronghorn antelope and elk permit application deadline is typically the second Tuesday in February. These regulations are set at the December Commission meeting. Electronic copies of these regulations are typically available the third week of December and printed copies are typically distributed starting the second week of January. Hunt Permit-Tag Application Form – Use this application for permit-tags issued through the lottery/drawing process and leftover permit-tag process. 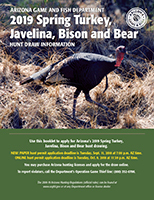 This booklet includes season dates, bag limits, hunt types, open areas, drawing application details, and information for spring hunts for turkey, javelina, bison, and bear only. The application deadline for spring hunts is typically the second Tuesday in October. These regulations are set at the August Commission meeting. Electronic copies are typically available the last week of August and printed copies are typically distributed starting the third week of September. 2018-19 Arizona Dove and Band-tailed Pigeon Regulations This regulation pamphlet covers the season dates, bag limits for the take of migratory birds. Hunters will find this new format more helpful and convenient. 2018-19 Arizona Waterfowl and Snipe Regulations This regulation pamphlet covers the season dates, bag limits, open areas, species restrictions for the take of migratory waterfowl species. 2018 Arizona Sandhill Crane Regulations This regulation pamphlet covers the season dates, bag limits, and limited permits issued through the drawing / lottery process. The application deadline is typically the end of August. For reference only, please refer to the appropriate regulation for specific season dates, hunt type, open areas, and other details. Commission rules may be amended at any time and persons are responsible for complying with the current rules, which are available on the department’s Rulemaking page. These regulation pamphlets cover the season dates, bag limits for the take and restrictions of species such as frogs, snakes and lizards. 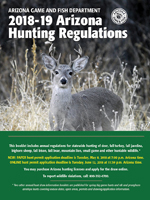 This regulation pamphlet covers license requirements, wildlife that can be legally taken, season dates, open areas, game management units closed to trapping, trapper education requirements, frequently asked questions, and other important information. A valid Arizona license is required for taking wildlife (including fish) in Arizona. The licensee shall carry the license when participating in hunting or fishing or other form of take. Take means pursuing, shooting, hunting, fishing, trapping, killing, capturing, snaring, or netting wildlife. Wildlife includes all wild mammals, wild birds, reptiles, amphibians, mollusks, crustaceans and fish. Improve your odds of drawing a hunt permit-tag. Do you want to find the hunts with the best chances of putting a tag in your pocket? Or, are you more interested in which hunts have the best harvest success? You can find that information and much more in the annual Hunt Arizona resource guide. The Arizona Game and Fish Department’s annual collection of survey, harvest and hunt data for big and small game has the latest 5-year data as well as historical data that you are bound to find of interest, some of it dating back to 1930s. Arizona offers some of the most unique hunting opportunities in North America for each of these species: Black bear, bison, white-tailed deer, desert bighorn sheep, elk, javelina, mountain lion, mule deer, pronghorn antelope and turkey.